If you grew up with eggnog, the kind you buy in a carton, forget it. Once you've tried Delightful Pastries' spiked eggnog, you'll never go back. Delightful Pastries suggests keeping eggnog on hand during the holidays for those unexpected guests or to enjoy a lazy evening by the fireplace. 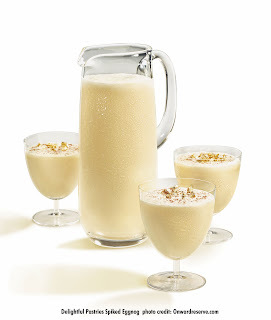 Rum Eggnog ($14.99) is a real treat—for those of you who have not had it, it is spiked liberally with Jamaican rum. Available at Delightful Pastries' Chicago French Market and Wells Street location only.